Ah … Tocade! This is one of the perfumes forever associated with critic Luca Turin. A bit of ‘harmless fun with roses and vanilla’ is what he called it in Perfumes: the Guide, but so beautifully done from top to bottom, with simple materials normally taken for granted, that it deserves five stars. I have no quarrel with a perfume that sets out do nothing but please receiving a top rating. Why not? Aren’t Shakespeare’s comedies masterpieces as well as entertainments? Does something have to be cool, dark or moody to deserve the highest accolade? No indeed. No-one – not even me! – can wear Chanel No 19 every day. That said, I don’t completely love Tocade. It is a bit too loud and too artificial (LT likens it to nail varnish) for me. I enjoy the sillage much more than the scent on skin. Vanilla is Tocade’s key message, and I can only take vanilla in moderate amounts, usually. There is a darkness to Tocade as well though. I think its ‘pretty, dancing feet’ have seen a few tawdry dance floors over the years. You know that beautiful song ‘Lullaby of Broadway’? It’s been recorded many times but I love Diana Reeves’ version, which pulls the tempo right back to a sweet, wistful imagining the life of a Broadway performer. Behind the ‘hip hooray and ballyhoo’ is a weary existence for a girl who works all night, every night. It’s early in the morning before she can go home to sleep; the ‘milkman on his way’. Tocade is her perfume. It’s a pretty, showy piece but with a haunting density of patchouli and cedar underneath. The vanilla is smoky as well as sweet. Backstage, as our ‘broadway baby’ she waits for her next cue, she rubs her calloused feet, mends the laced on her dress, and longs for her rest. Sure, her ‘daddy’ buys her ‘this and that’. Perfume, sweets and roses adorn her corner of the dressing room. But when she goes home, she sleeps alone. Tocade has strong sillage and lasts ages. I snapped up a bottle in the old, crazy packaging, but in 2013 Rochas shoved Tocade into a uniform bottle. I don’t know if the formula has changed, so do comment if you have compared them. FragranceNet has the 2013 edition under $50/100ml Before Coupon! The apparent simplicity of Tocade never fails to give me something to think about. And what about you? Do you have a perfume in your collection which is as puzzling as it is beguiling? Sweet but sad? Until next time, keep spritzing everyone! I LOVE Tocade. i find it one of the more palatable vanillas- and let’s face it, vanilla has been done to death lately, but when sued well, it’s a total knockout. I also get sandalwood from Tocade, which I always love. 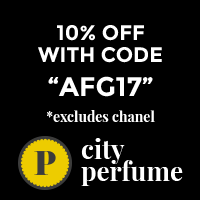 This is a classy scent that is very good value. You can still get 100ml for around £30 -£40 quid. “used well” not sued well. No edit button! Knickers. I have no memory of the smell of Tocade. It’s weird. I love the bottle, adore Rochas and have always thought I’d like it. I think there may even be a vintage perfume here that I am yet to open. I’m going looking for it tomorrow. I bet you have it somewhere Portia. It’s one of those fragrances that got a lot of mentions on the blogs probably because of the LT review. So you’ve probably though ‘Ah, I must try that.’ And Tocade has never been expensive. I love a lot of Rochas, but like Portia, I just don’t recall the scent of Tocade. But (unlike Portia) I don’t think I have one around anywhere. I do know that Rochas did a lot of reforms in the late 80s, including my beloved Femme and subsequently changed the bottles too. Actually I like Femme both ways, old and new! Thank you for another great review! I have vintage Tocade, how many have had their vintage Tocade turn really dark? Mine is is a rich golden amber. (Same colour as Rochas Femme, actually.) I bought it ‘new’ from a discounter but it’s in the old packaging and is probably quite old stock. A mini I bought about 5 years ago is the same colour.